Amplify the reach of your videos by publishing them natively to social media platforms. 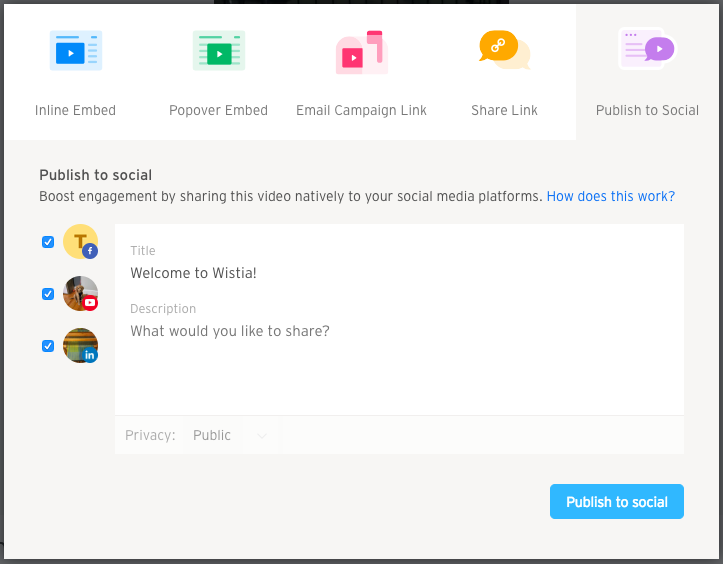 Publish to Social allows you to connect Wistia to your Facebook, Youtube, and LinkedIn accounts, providing the option to directly upload your video content to your social networks. By sharing your content natively on social, you can make use of the full functionality of each platform’s built-in video player to boost engagement with your content. This feature currently supports publishing directly to Facebook pages, Youtube channels, and LinkedIn company pages. This feature is not compatible with Soapbox videos exported to Wistia. At this time you can only publish videos that you’ve uploaded to your Wistia account. If you are a user on a paid Soapbox plan, you can download your creations first, then upload them to Wistia and Publish! To connect your social accounts to Wistia, head over to Account → Settings → Integrations (only the Account Owner can access this page). Under Social Media Integrations, you can click on the desired platform and choose connect. From there, you’ll be asked to approve Wistia’s requested permissions on your social account. Once you allow these permissions, the integration will show as connected in Wistia, and presto ✨, you’re all ready to publish! Once a social account has been linked to Wistia, a Publish to Social section will appear within the Video Actions → Embed & Share menu. From there you can select which social networks to use, as well as edit the title and description of the post. Not ready to share the content with your networks just yet? No need to worry, the standard privacy options for each platform will be available before the video goes live so you’ll be able to customize the visibility of the post/video. This way the video will not be immediately visible to the public if you so choose. Want to see how your sweet videos are doing? You can see social stats from all of our supported social networks! Stats will be available for videos that have been published directly from Wistia to Facebook, Youtube, or LinkedIn. When you publish your videos to social, we’re directly uploading a video file to that platform. That means you won’t be seeing the Wistia player there, you’ll instead be using the native players of each respective platform. This also means that your Wistia-specific customizations won’t carry over. So why publish to social if you don’t get the Wistia functionality? Natively uploading videos to social means you can use the built-in functionality that might not be available with a Wistia embed. Whereas the Wistia player is great for driving traffic to your website, uploading to the native player on other platforms is great for other use-cases where you purely want to increase the visibility & reach of your content. If you’d prefer to keep these features, then you may want to embed your video and use our Social Sharing options instead.